"The characteristics of Krsna are understood to be a storehouse of transcendental love. Although that storehouse of love certainly came with Krsna when He was present, it was sealed. 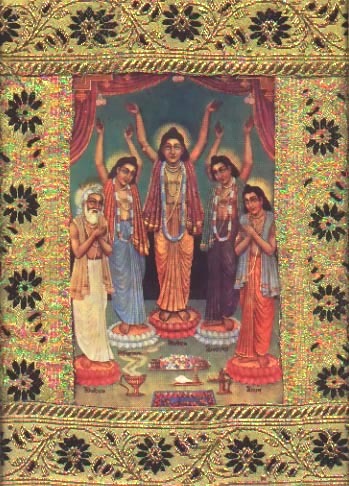 But when Sri Caitanya Mahaprabhu came with His other associates of the Panca-tattva, they broke the seal and plundered the storehouse to taste transcendental love of Krsna. The more they tasted it, the more their thirst for it grew. "Sri Panca-tattva themselves danced again and again and thus made it easier to drink nectarean love of Godhead. They danced, cried, laughed and chanted like madmen, and in this way they distributed love of Godhead. "In distributing love of Godhead, Caitanya Mahaprabhu and His associates did not consider who was a fit candidate and who was not, nor where such distribution should or should not take place. They made no conditions. Wherever they got the opportunity the members of the Panca-tattva distributed love of Godhead. "Although the members of the Panca-tattva plundered the storehouse of love of Godhead and ate and distributed its contents, there was no scarcity, for this wonderful storehouse is so complete that as the love is distributed, the supply increases hundreds of times. "The flood of love of Godhead swelled in all directions, and thus young men, old men, women and children were all immersed in that inundation. "The Krsna consciousness movement will inundate the entire world and drown everyone, whether one be a gentleman, a rogue or even lame, invalid or blind."